Rice Toyota adopted LogMeIn Rescue to accelerate the resolution of IT helpdesk tickets. Nucleus found that Rescue enabled Rice to resolve issues more quickly by remotely accessing employees’ computers, driving greater IT and general staff productivity and better business continuity. 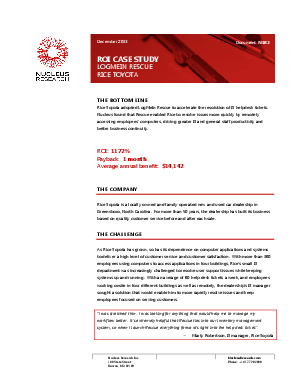 This case study analyses the ROI experienced by Rice Toyota in using LogMeIn Rescue. Download now to find out more.